Exactly! Ever since the Marjorie Stoneham Douglas High School shooting we’ve been reading about the security guard who did not go in to help. We see his name, how old he is, where he worked before and what he did – or did not – do. But what about the first responders who did go in? 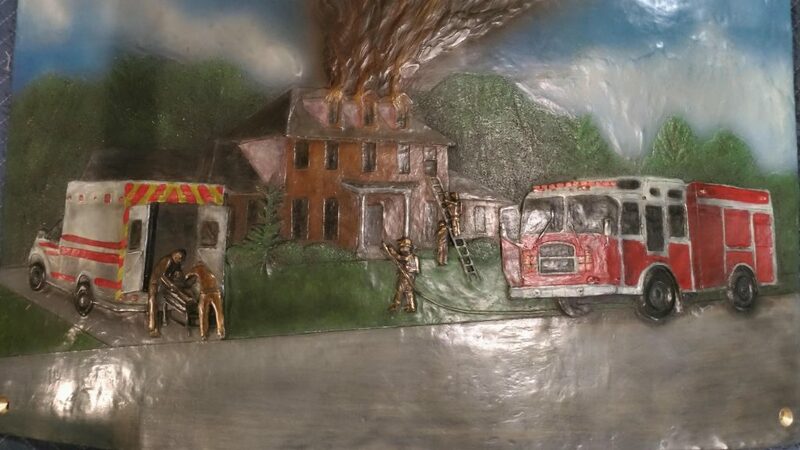 Or the first responders who went into the flaming motel to save the tourists from Michigan? Or the first responders who took the rifle away from the man who….? Or the first responders when they……..? Most people don’t remember their names, do they? And we don’t know their names either. One of the reasons that we don’t is that their names were not in the newspaper, or on TV, or the news feed on our cell phones. And the reason their names were not flashed in front of us after they risked their lives saving others is that there are so many of them – and they do it all the time. Yes, there is a whole world out there comprised of First Responders who are willing to lay down their lives to protect us. And there is an even more important group – those First Responders who really did lay down their lives – and who will never be able to rise again. Last September the United States Postal Service issued a Forever stamp honoring all First Responders. The ceremony was held at The Aerial Fire Depot and Smokejumper Center in Montana. And, on the first of this month, the dedication is being held for a memorial to fallen Firefighters, in Tallahassee, in front of our State Capitol. 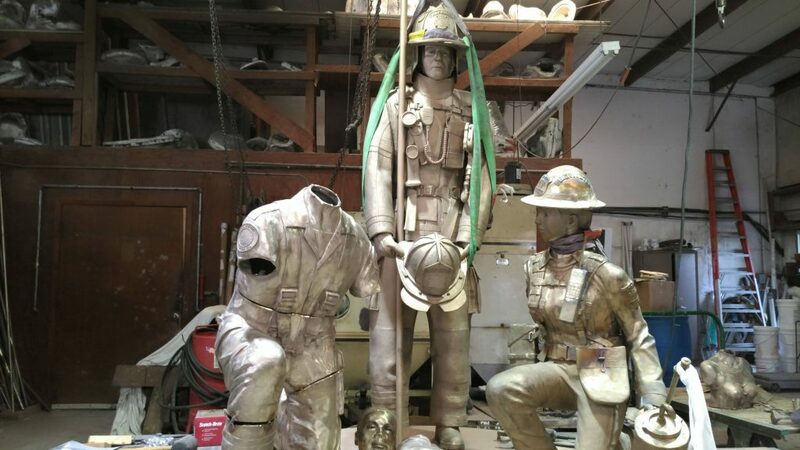 There has been a Firefighter Memorial Monument there, of a more modest nature, but a new one is rising, based upon a painting by the artist Jim Davis. The Sculptor Michael Jernigan, who was involved in the original memorial, has created this more significant monument. 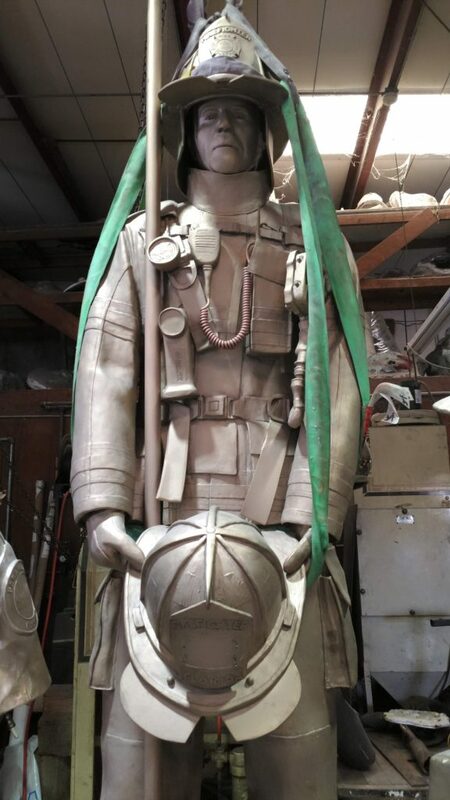 It will use the old memorial as its base and will portray a Firefighter, a member of the Florida Forest Service and a Paramedic, and be surrounded by plaques portraying these first responders in action. The sad, and very touching part, is the living firefighter holding the helmet of a fallen comrade. The number on the front of that helmet is not the fire brigade unit number, but the number of firefighters that have died in the line of duty. 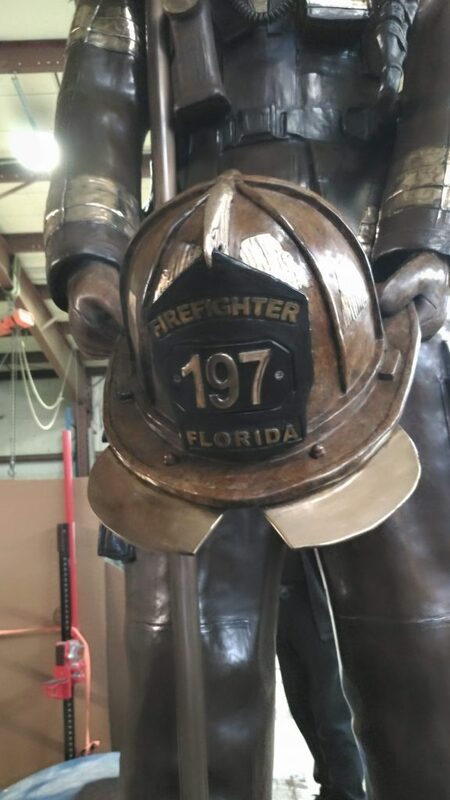 Currently at 197, higher numbers have already been cast at the BronzArt foundry here in Sarasota, where all the work has been done, as the number is continually rising. 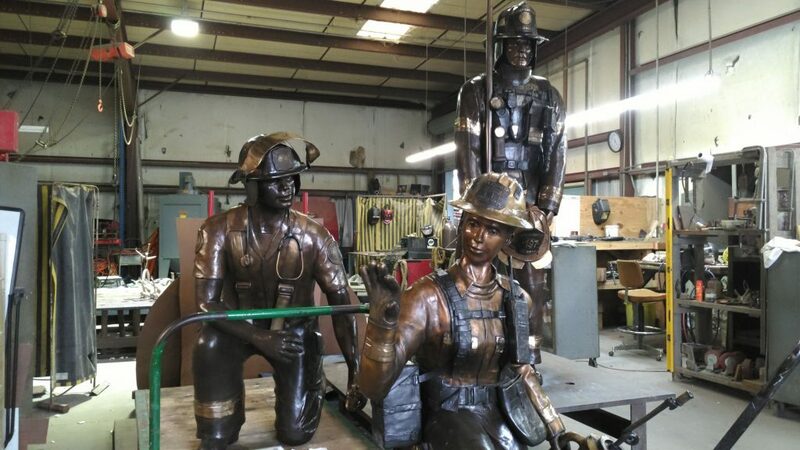 The creation process for a large sculpture is very interesting, detailed, and time consuming. 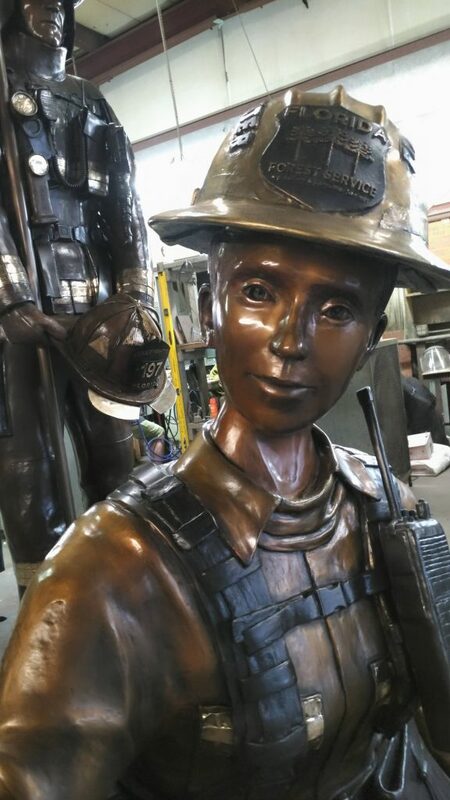 The first step for the sculptor is to make a small scale model that can be shown to the person or organization that has commissioned the work. Those that pay for a sculpture want to know what they will be getting before the work is started. When the project has been approved, a larger model can be created. The sculptor often builds a metal frame over which a coating of plaster or paris or other material is placed to create a substructure which can hold the final layers of material. The last layer of clay may be changed or altered until the look is exactly right. Because of the strong framework this version can be transported to a foundry, such as BronzArt here in Sarasota, where an entire new process is begun. 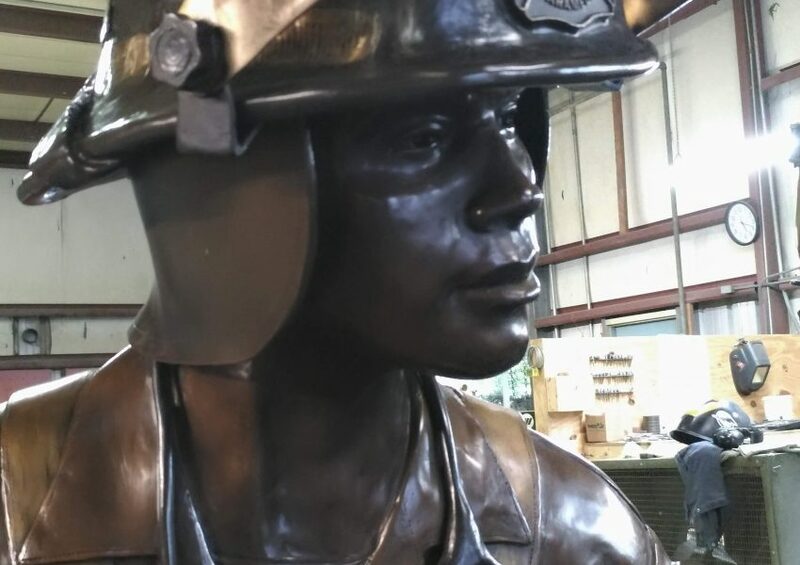 What the artist delivered to the foundry is coated with a rubber like material to create an initial mold which can be reused if multiple copies are to be made. Wax is poured into the mold and is removed when hardened. The new wax replica is dipped into a ceramic material to create a newer heat resistant mold around the wax. The temperature is raised and the wax is burned out leaving a hollow core which is, in every detail, exactly the same as the original piece. Molten bronze is then poured into this space. 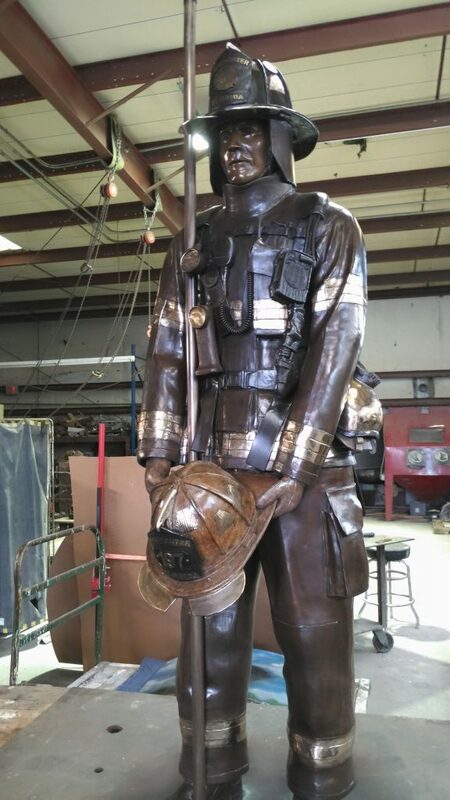 When the bronze casting is completely cooled, it is blasted with hundreds of thousands of glass beads to smooth the surface, burrs and rough patches are ground down and, with various chemicals, the patina chosen by the sculptor is added. It should be noted that the preceding description is an approximate summary of the actual process, as a dozen or so steps have been left out. While all of this is extremely labor intensive and time consuming, the result lasts for the ages. Bronzes cast thousands of years ago still display the beauty that their creator intended you to see. The series of photos show steps in the final process of assemblage. Before and after arms have been added and the patina applied. The last photo shows one of six different panels that now surround the base of the sculpture which was unveiled in Tallahassee on April 1st. 20 minutes vs. 2 hours and 50 minutes – What’s the difference? A world of difference, or no difference? None, if you simply focus on the fact that, either way, you are listening to Nikolai Kapustin’s Trio for Flute, Cello and Piano, Op. 86 at Sarasota’s La Musica International Chamber Music Festival. The big difference comes from understanding how three really well trained world class musicians, Demarre McGill, flute; Dmitri Atapine, cello; and Derek Han, piano, who have never played this piece as a unit, can join as one force, with just two and a half hours of practice, and pull off a stunning performance at the Opera House on April 14th. Well, maybe the day before they play they have a glass of wine together and discuss the finer points of vibrato, timbre, and resonance. But the point is that, while you may not be listening to their discussion over wine, you can, over two days, sit and listen to them go over this lovely music as it coalesces into its final 20 minute form. On the same program there is a sonata by Debussy and a Quartet by Schumann. There are 26 open rehearsals for the works being performed during the festival. A day pass lets you listen to 3 or 4 of these sessions at New College’s Sainer Pavilion (a lovely venue) – that’s four to five hours of music per day. If you play (or just love) the flute, cello or piano, or just want to watch and listen to how these artists can, from a high starting point, put a great performance together, you can do so. Or take Mozart. Yes, why not take Mozart? How about listening to his Flute Quartet in D Major for two hours (one hour on each of two different days) as it is constructed, de-constructed and re-constructed until it reaches its final form on April 11th. Want something without the flute? How about Mozart’s piano quartet in E-Flat Major. With this one you can get over two hours’ worth of rehearsals before listening to the final take on April 17th. And, with each of his quartets, you get hours of other works by Brahms, Beach or Schoenberg. Think Mozart’s Flute Quartet is for the birds? Well, you’d be right. Four songs about birds (Händel’s Sweet Bird; Delibes’ Le Rossignol; David’s Charmant Oiseau; and Benedict’s The Gypsy and the Bird) are sung by Catherine Wethington, accompanied by flute (you know, bird like sounds) and piano, on one of the Mozart Quartet programs. 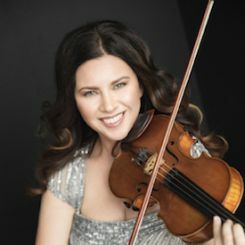 For you fans of Dvořák, there is a string sextet on April 8th, along with pieces by Martinů and Beethoven. Or mingle with some Festival musicians (wine and light snacks) in an empty Dolphin Aviation airplane hangar and hear them play a mini-concert. Information at lamusicafestival.org. You know how that poem starts: Monday’s child is fair of face. And a bit further it continues, Wednesday’s child is full of woe. That poem was first written down in Devonshire, England in 1838 and was used to teach children the days of the week, not to predict anyone’s fate, but….. The world premiere of Wednesday’s Child opens at the Florida Studio Theatre on April 3rd (yes, a Wednesday), and runs through May 24th. This play is a murder mystery and, as with all murder mysteries, secrets surface, alibis weaken, and lies are uncovered. But, of course, we don’t know the who, what, why, when, where, which or whence of any of this – or on which side of right and wrong the various protagonists end up. Three years ago FST produced Mark St. Germain’s play Relativity to great success. The main premise was about how Albert Einstein would react if, while living in Princeton, he met the daughter that he thought had died as a child. Since this new play, Wednesday’s Child, is written by that very same Mark St. Germain, we know that we should be in for a very thoughtful and soul searching evening. Or matinee, if you don’t want to come home from this mystery in the dark of the night. But you needn’t worry, you won’t remain in the dark as everything will be resolved. Right? Kate Alexander directs. The play will be at the Gompertz so it is possible to have a lovely dinner before-hand. Tickets and more information at www.floridastudiotheatre.org. Musical Note: The group, Musical Friends of Sarasota, will be holding their second annual recital at Selby Library – 1:30 PM on April 30th (free). Solo, duo, trio and quartet chamber music.